And he/she is a jerk. The breed is Boxer with something else. At least I think it’s Boxer. I’m bad with dog breeds and tend to lump them together into more easily definable categories. My first encounter with the dog was fine, comical even, as I was taking my dog out to the bathroom and the neighbor’s dog seemed a little bashful at first warming quickly toward playful. My dog Jenkins is typically aloof, happier to spend his time at the dog park hanging out with humans over his kind, and as such, sniffed at Neighbor Dog for a few seconds before moseying off to do his thing. Nothing more. End of encounter. Neighbor Dog lives on the first floor with one of the bedroom windows facing the grassy area most of the dogs gather to relieve themselves. Every time I take Jenkins past that window, it’s like a lion freaking out having seen a piece of meat. Neighbor Dog’s sudden need to maul feels so heavy there are times I’m concerned a simple sheet of glass will do nothing to sake the ire. I’m not sure what prompted the change – did Jenkins ignoring them set off some already faulting wire? – but the result is less-than-necessary. I often put myself between the two while Jenkins again does his thing, still unconcerned, me staring into the agitated black eyes of the beast while it salivates. I saw a video of a Norse man confronting a charging moose, and though not entirely similar, I like to think my braveness level in this is creeping even. I don’t know what would happen should the two meet again. It’s strange to me how nice the neighbors seem too. They have two boys. Perhaps Neighbor Dog is concerned the other dogs are looking to mug them, I don’t know. I tend to wrongly approach every dog as though they love me and want only my attention and affection. But not Neighbor Dog. Neighbor Dog is a jerk. Bahia Honda is (about) the halfway point of the Keys. The island of Marathon is about ten to fifteen minutes north with Key West around forty minutes south, which wasn’t too bad a place to be. Admission is eight bucks per car, but if you’re staying overnight (which was something like thirty, maybe), admission is included, and staying at Bahia was easily one of the best decisions of the trip for my wife and I. There are two beaches, one on the Gulf side which was mostly lame since it’s sectioned off making a bit of an impromptu lagoon and facing both the original bridge and the current bridge, so the view itself wasn’t all that spectacular, and one on the Atlantic side which was really a series of beaches broken up along the coast. Though the beach(es) on the Atlantic side were narrow, seaweed and rock infested things without a place to lay out comfortably, the swimming was pretty great. No real waves to speak of. Clear waters. A bunch of aquatic life I both recognized and didn’t. My wife saw a barracuda. I saw a stingray. We were “caught” in a school of fish, tiny and in the (seeming) thousands, them inciting a brief moment of panic where I wondered what they might be swimming from. Saw sea urchins. Other stuff. The Florida Keys Astronomy Club meets in one of the parking lots there. It’s billed as a “come and learn” type of event, though it was more the Club is allowed to come as they please to stargaze as long as they entertain the questions of campers who might wander by. Just my wife and I showed which made it a little awkward and difficult to escape when the time came as we both felt the need to be overly invested/interested regardless of what they showed. I personally thought it was awesome getting to see Jupiter and Venus and hearing the mythology behind a number of the constellations, though I think my wife went in expect NASA images not realizing how the process works, so she was understandably disappointed. A good time in spite of, and the two guys we met were a pair of sixty-year-old kids. Giddy to the point of infectious. My wife and I are not nightlife people. I mean, I’ll be up late, but we don’t go out doing what I would assume someone correlates with a “nightlife thing”. In fact, I had my first real “club” experience this past weekend at the tender age of thirty-four. Still, there is little to do on Marathon after hours. You can go to the grocery store. There’s that. An IHOP is open twenty-four hours, which turned out way better than it should have been. And this is not me saying I wanted something “touristy”, but one you option is grocery store, IHOP, or bar after 7 p.m., that’s a little sad. Par for the course in experience, though, with reality not quite living up to expectation. At least give me some Go Karts. Go Karts between the islands. Lastly, the nature center at Bahia Honda is depressing. Not so much a nature center as a nature room, and one filled with equally depressing models of wildlife and a video playing on loop. However, we were able to identify the barracuda I was initially convinced was not a barracuda after the story was first related to me. My expectations were high. I’d mentioned in an earlier post how the Beach Boys may have oversold the desirability of Key Largo some, and the downward spiral of realization the further into the island we drove was a relatively fast descent. Initial impressions were good: color and people and shops and food and signs promoting what you’d expect to see promoted. About a minute after this small patch things went further south, however, both literally and figuratively. There was the Bird Sanctuary I also mentioned earlier featuring Leopold and Ruby who became vacation favorites. Beyond that? Little. Buildings became run down things. Lawns the same. I won’t say the comparison is a fair one, but I was reminded of those towns that spring up around some natural resource only to see the stuff run dry and the town forced into decline shortly thereafter. Signs of life exist, though it’s the type of existence you’re likely to think of when you read McCarthy’s The Road. We had diner at The Fish House Restaurant and Sea Food Market. The food was as you’d expect it to be, especially when it’s attached to an actual market. My Mahi Mahi was awesome. My wife got the Conch basket which was also good, though not equal. Pie was had at Hobo’s Restaurant. The pie was fine. It was pie. Hobo’s wasn’t really Hoboy (Hoboie? ), which was a little disappointing, more a sports bar where we arrived on Mexican night. Dunno. Go see the Bird Sanctuary. Eat at the Fish Market. Then: drive. Key Largo is a sad blip on the journey to better beaches, better sights. I had intended to make today’s review about Shovel Knight, and I’m sure some of you will be devastated, but it’s been bumped back to make room for a much better discussion. One on people. And birds. Three people I met at the park yesterday in-between fits of rain. Some history. I am an introvert. Still am, though I’ve gotten somewhat better. My comfort zone is and will always be found within a book away from others, but I can at least hold my own inside a small crowd now, and not want to push myself slowly through a sheet of plated glass. This, by definition, is progress. A large portion of that progress is attributed to my wife who is far better at being extroverted than I. She too is an introvert at heart, but she’s much braver at stepping outside her bubble than I am, often realizing in order to grow as a person you need to be willing to sometimes walk/run off that ledge no matter how high or low to the ground said ledge might be. Talking to others is small potatoes in the grand scheme, sure, it’s just not where I’d generally like to spend my time. However, in an effort to be more, say, broad, I’ve attempted to open myself up to stranger experiences. More natural experiences. Interactions, maybe. My wife would call this “following the crow”, which is a whole review in and of itself which I may touch on somewhere down the road, but I feel the moniker is pretty self-explanatory as a stand-alone statement, so you likely get the gist. But, by quick way of definition: I was in Asheville, North Carolina recently, and drove by a sign which said “Come Meet So-and-So, An Authentic North Carolina Hillbilly” and, on the sign, a crow was perched. I said heck with it, I’ll meet a hillbilly, and pulled over. Following the crow. There is no crow in this story, but there is a bird, which is mostly the same thing. I try and take my dog to the park as often as I can. One, because he needs to lose weight. Two, because I need out of the house. And three, I like seeing his ears spread out when there’s a breeze. A handful of times now – say three, maybe four – there has been a trio on the trail when I’m there, always with binoculars, and always staring off toward some indeterminate point. They all appear to be late sixties, early seventies, the man with the white-white beard every day wearing a hat so wide and floppy he would do well in Ladies In Lavender were we living on an English countryside, and the women both in coats long enough to double as Hogwarts attire. I don’t know the politics of small-talk when passing a person on a nature trail, and I’m awkward enough when opening the window to any conversation, which led me, I believe, to blurt out “We must be on the same schedule”, leading them, I believe, to lower their binoculars in unison (or in unison in my memory), and stare. This may have lasted seconds, hours, both possible when your dog is trying to get someone’s or something’s attention by wiggling on his leash like a fish fighting for air. Alek, with a “K”, broke the pause with a very loud “I remember you”, which was directed at Jenkins – my dog – and not me. This is how I met Alek, Louise, and Louisa. Louise, and Louisa are twins, one with shoulder-length gray hair and one with shoulder-length red, dyed, I’m told, for Halloween, though she doesn’t have a costume. The three of them are from southern Ohio, staying in Columbus having heard there were some sightings of American Pipits in the area, which I had to look up, a bird none of them had seen and were anxious to check off their list. 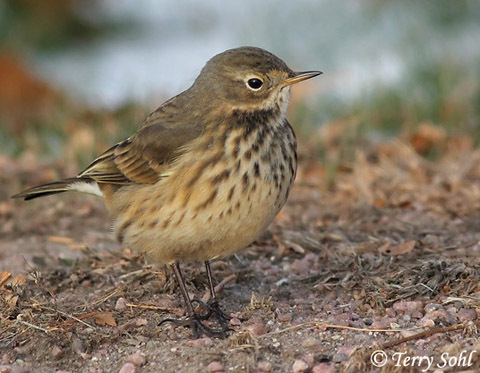 Ohio is on the Pipit migratory path, though supposedly we don’t see them all too often, according to Alek (whom I trust, what with his binoculars and his hat, and his infectious enthusiasm when talking birds), making this season “particularly exciting”. We were on the upper part of a slope, the shore and heavier mud hidden by trees, Louise or Louisa looking down toward the water again and waving me over. I am not a bird person. I like them just fine, but I am more likely to go out of my way for a rare sandwich than I am a bird (who could turn out to be a sandwich, now that I think about it), but I will admit to having a strange spine-shock moment putting the lenses to my face and seeing a tiny group of brown-speckled birds hoping clump to clump in the mud they match. I’d never heard of a Pipit. Had to text myself the name just so I’d remember to look them up. Maybe I’ve stumbled across them already in my travels and never thought to look up or down or twice at them. And like the birds, I’ve passed thousands of Aleks and Louises and Louisas and also never looked up or down or twice at them, which is a shame, though I don’t know if I see myself ever getting comfortable enough to completely change. I will say, it’s a neat thing when you can get to know a person, really get to know a person, without sharing too many words. That, like a Pipit in my neck of the woods, is rare, and deserves some attention.